Feather Down Farm Holidays define themselves as posh camping with children. There’s an excellent choice of farms across Great Britain, France, Netherlands and the United States including Locks Farm on the Isle of Wight. This farm is the first Feather Down site on the Isle of Wight and is situated on the tranquil western side of the island. Camping in one of the two fields behind the farmhouse there is a tidal saltwater creek less than 100 metres from the tents which is part of a protected nature reserve where huge bass and mullet hang out. From the farm you can walk along road and path to the sea at Thorness Bay and the sand and shingle at Gurnard Beach. Rent your own chicken coop, explore the farm and its surrounding area on two wheels (child bike hire), guided nature walks and baby equipment can be provided. A typical mid week break costs £259 for 3 nights starting 22 April 2014 in a frills tent that sleeps 6 (max 5 adults and 1 child up to the age of 12). A new concept in luxury camping these beautiful domes can be found on a spacious, friendly camp site in the south-west of France. Designed with space and comfort in mind the domes feature hanging beds for the children, comfy Fatboy bean-bags, proper king-size beds with high-quality mattresses and a covered, substantial al fresco dining area with a state-of-the-art ‘plancha’ gas cooker for all your dining needs. 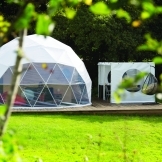 Glisten Camping have hand picked Col d’ibardin as the first site to feature these luxury domes. On site there are kids and grown up pools, a kids’ club and activities, sports and games for teenagers and reliable clean facilities. Weekend breaks (three nights) £425.00 and midweek breaks (four nights) £425.00 are available in the low and mid seasons. Seven night breaks start from £560 in the low season. Season starts 1 April 2014. Domes sleep 6 people (4 adults max). Glisten Camping | Luxury Camping South of France. If you want a great saving on your Canvas holiday book by 31 January 2014 and SAVE up to 25% – the amount of discount applied is determined by the length of stay and the arrival time. Even during the peak summer period there is a 5% discount to be had. Only a £99 deposit is required to secure the booking. Canvas has sites across France, Spain and Italy with a range of accommodation including camping, mobile homes, lodges and apartments. If you have holidayed with Canvas before then you can save an additional 3% on your second holiday or 5% if it’s your 3rd. Want to camp with a baby in France but no room in the car for all the equipment required. Camping Indigo has sites all over France and on request will provide a high chair and cot free of charge on all camping holidays booked (excluding July and August). A Camping Indigo holiday is all about living a simple outdoor lifestyle on a natural site in the heart of a beautiful region in France. A range of accommodation is available including Wood & Canvas tent (some with own bathroooms), gypsy caravan, chalet or mobile home. Sites include swimming pools, playgrounds, a friendly place to eat, clean toilet and shower and baby changing facilities and in the summer a varied programme of simple activities on and off site. Camping Indigo is a great choice for your camping holidays in France. Booking by phone is required when requesting baby equipment. Ski Famille is offering a week of low cost skiing before the season kicks off officially on 21 December 2013. Ski Famille is looking for families with an eye for detail to provide feedback on the holiday experience in order to perfect the experience ready for guests arriving for the Christmas week. In return you get a week of great value skiing and fun! Prices start from £445 per adult and £375 per child in Les Gets and £535 per adult and £445 per child in Reberty Village. Price includes: seven nights accommodation with breakfast, afternoon tea, evening meals, five days childcare, children’s ski school collection/delivery and channel crossings or airport transfers.Contact Angela or Sheila on 01252 519 239 for more information. Family Ski Offers – Family skiing deals & Ski Chalet offers | Ski Famille. These beautiful tipis in the south-west of France are perfect for families with space for up to 4 children. There are three tipis in total that can be booked individually or as a group with exclusive use. The site is open for a few more weeks so book now for a last minute getaway or book early for next year when the season opens next year. Each tipi is individually hand finished and painted with traditional Navajo art work. There is a superking sized bed for the adults and for the children single beds. Cots can also be provided for younger guests. What I love is that there are spacious lockable private bathrooms with shower, flushing toilet and porcelain sink on antique sewing machine pedestals. Baby baths can be provided. Visit the local French markets, hire bikes and take the family to some lovely local parks. Rates are £83 per tipi and bathroom per night and £500 per 7 nights. There is free Wi-Fi. Pet friendly too! Glamping Tipis in France | Family friendly glamping holidays in France. Emerald Coast Gites is a collection of 1 to 4 bedroom family friendly self-catering holiday gites in Brittany. La Boulange sleeps 2-4 plus infant in 1 double bed and a lounge sofa bed and has availability at the end of September. The complex has a heated adult and toddler pool in a fenced enclosure. This family friendly gite Brittany is a paradise for children. There is a selection of toys and books, stairgates, blackout blinds, kids crockery, cutlery and beakers plus extras like travel cots can be provided. For under 3s there are swings, slides and ride-ons plus an undercover soft play centre .For older kids there is a multi-activiity play area with swings, slides, climbing wall, mini football pitch, basketball hoop and trampoline. There is also an indoor games room with pool table, table tennis table, electronic dartboard and a Nintendo Wii. La Boulange is available late August. A week starting 21 September is 726 euros. Any bookings made within 15 days of travelling will receive a 25% discount. La Boulange, Brittany Cotes-D’Armor, Brittany Brittany France, Baby Friendly Boltholes. The Mountain Adventure Company offers bespoke family adventure holidays in the French Alps – expect a mix of adrenaline activities combined with the opportunity to participate in French lessons. The Camp is based in the traffic free village of Tania on the edge of the Vanoise National Park. Choose between a 4 or 7 day family adventure. Typical activities on the four day adventure include white water rafting, a trip to an adventure park with Tarzan swings and a 130m zip line and 4 hours of mountain biking. On the 7 day adventure you will experience the above plus a half day skiing or snowboarding on a glacier, a 3 hour mountain hike with overnight camp and an afternoon of via ferrata. Interactive French lessons run in the mornings. There are spaces remaining on both the 4 day and 7 day late August break. The 4 day break runs from Friday 23 August to Monday 26 August and costs £219. The 7 night break starts on Saturday 24 August through to Saturday 31 August and costs £499. Accommodation is in a purpose built chalet lodge in a private wooded location. Nearest airport is Geneva. Mountain Adventure Camps – Holiday Duration. PGL’s final summer sale is now on with a raft of great offers on summer camp and adventure holidays for 7 to 17 year olds. With Centres across the UK and France and with a wide range of activities to try from rafting to climbing to pony riding these holidays will not disappoint. Holidays must be booked by the 8 August. Up to 60% off on selected 7 night UK Multi Activity holidays, including First Timer holidays for new customers. Plus, we also have three for two on selected two night Taster Holidays for new customers! Offer code HOL33X. Book one, get one FREE! Book one child and a second child goes FREE on selected 7, 4 and 3 night UK Multi Activity holidays. Offer code MAT33X. Just one child? Save 30% off* when you book one child on any of the 7, 4 and 3 night UK Multi Activity holidays shown in offer two. Offer code FREE33X. Up to 40% off selected 7 night Specialist Holidays. Offer code SHS33X. Up to 40% off selected French holidays. Offer code OSA33X. PGL Summer Camp and Adventure Holidays – Adventure, Freedom and Friends.